Sense & Sensibility at Irish Classical Theatre is still very much a Jane Austen experience, but it seems as though that lady might have ingested a steroid with her tea, or perhaps even a psychedelic or two. Playright Kate Hamill has blown it up into a mélange of stylized dialogue, extravagant gestures and accents, creative stagecraft, and just plain delicious fun. Add a stellar cast and fine direction by Chris Kelly, and you have an Austen experience like no other. 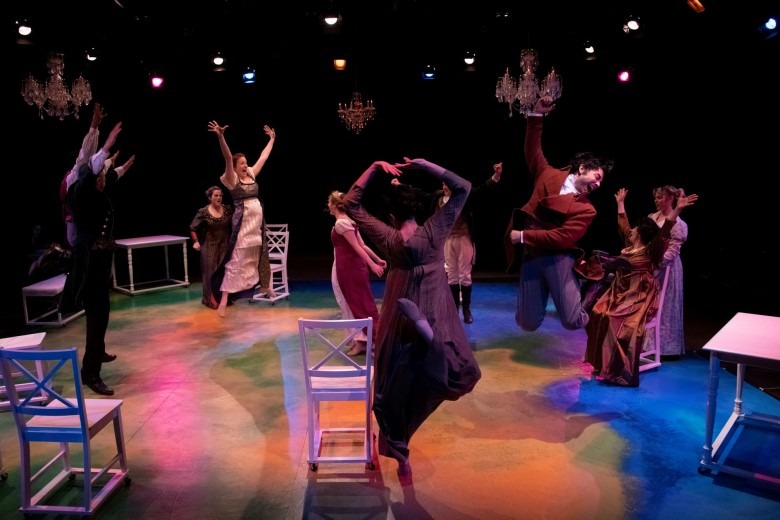 Sense & Sensibility maintains the mores of the landed gentry of Regency England regarding the roles of ladies and gentlemen and Austen’s, well, sensibility, in the story of the Dashwood sisters, while pumping up the energy level to high octane. The gossips are gossipier, even gossiping to the audience; the penurious Fanny and John are even more penurious; the obnoxious Robert Ferrars is even more obnoxious. The ten actors fly around the stage on chairs and tables with castors, wheeling from one scene to the next. They become animals and carriages and forests and…and… For instance, one scene includes three hilarious hounds. In the center of all of this commotion are Elinor and Marianne Dashwood, beautifully played by Kristin Tripp Kelley and Renee Landrigan, each embodying the characters of their roles--Ms. Tripp Kelley the reserved, rational Elinor, and Ms. Landrigan the passionate, free-speaking Marianne. The two sisters are of marrying age and, with their mother and younger sister, are forced to leave their home after their father’s death due to the law that does not allow women to inherit. Instead, the estate goes to their half brother, John and his wife, Fanny. Before they leave, Elinor meets the modest and bashful Edward, brother to Fanny. They connect, but there are complications. After the family moves to Devonshire, Marianne falls instantly for the dashing John Willoughby. They connect, but there are complications. And an older friend of their distant relation, Colonel Brandon, falls instantly for Marianne, but she has eyes only for Willoughby. The second act resolves all complications, of course, and everyone goes away happy, including the audience after shedding a tear or two in addition to enjoying a great deal of laughter. Kate LoConti Alcocer is a hoot as the parsimonious Fanny and the ridiculous young woman Lucy Steele. Jenn Stafford is just as ridiculous as Lucy’s sister Anne. As Mrs. Dashwood, Ms. Stafford expresses the warmth and reserve one would imagine in a woman of her time. Ben Michael Moran is excellent as both Ferrars brothers, the humble and diffident Edward and the foppish lout Robert. He is very funny as Robert, whirling himself around the stage on a bench, expounding on the virtues of “a cottage.” Anthony Alcocer is suitably inhibited and aloof as Colonel Brandon, expressing his longing for Marianne in his eyes and in small gestures. Brittany Bassett is charming as the inquisitive young sister Margaret. Brendan Didio’s chin thrust as John Dashwood is quite entertaining, and as Willoughby, he clearly expresses that character’s charm, selfishness and self-pity. Josephine Hogan looks like she is having great fun as the main gossip and storyteller, Mrs. Jennings, as does David Lundy as Sir John Middleton and his mother. Set Designer Dyan Burlingame set several crystal chandeliers above the stage to denote the wealth of the gentry, with the wooden chairs and tables on castors acting as the set for all the scenes. Brian Cavanagh designed the lights. Tom Makar designed the sound, which includes the music Marianne plays on an imaginary pianoforte. A. Lise Harty designed the Regency costumes. 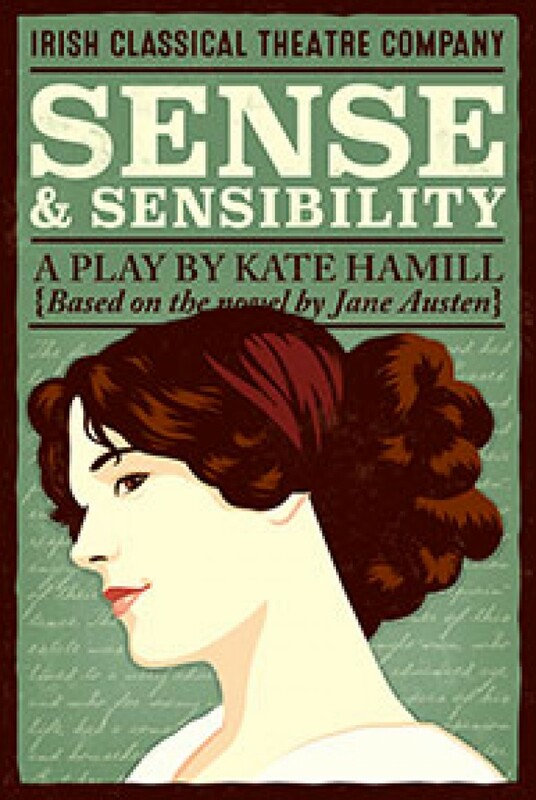 Sense & Sensibility is a very clever, creative and modern take on the Austen oeuvre. It feels fresh and traditional at the same time and is entertaining as hell. Oops, Ms. Austen would never allow such a word to appear in her writing, nor I believe, do lovers ever kiss in an Austen novel. But this is the 21st century. And ICTC’s production of Sense & Sensibility is, after all, for 21st century audiences. You can see it at the Andrews Theatre through February 10th.